Frederick Emil “Freddie” Kemfort, III, 36 of Red Lion, went to be with our Lord on December 13, 2015 after putting up a heroic fight with cancer. Born on July 30, 1979 he is the son of Frederick E. Kemfort, Jr. and Patricia (Altemos) Shappell of Pottsville. He was a graduate of Pottsville Area High School. After graduation, Freddie enlisted in the United States Army where he fought for our freedom in Operation Iraqi Freedom and Operation Enduring Freedom. Freddie was a volunteer firefighter serving the Humane Fire Dept. #30 in Pottsville where he was a life member, Exeter Twp. Fire Dept. #25 in Reading and Yorkana Fire Company #38 in Yorkana. He was a member of the Red Lion American Legion Post 543. All those who stood beside him would commend his valiant efforts and was a fireman’s fireman. 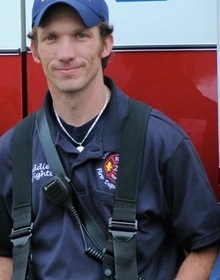 Along with his parents, he is survived by his loving wife, Lindsey, son Aidon, daughters Zoey and MaKenzie, his caring in-laws Randall and Jonda Klahold, sister-in-law Kasey Klahold, a brother Christopher Kemfort of Joppa, MD, step bother and sisters Jennifer and Jon Curvey of Pottsville and Samantha Curvey of Andreas. He was preceded in death by his maternal grandmother and paternal grandparents. A funeral service will be held on Friday, December 18, 2015 at Bethlehem United Methodist Church, 109 East Main Street, Dallastown. Those attending are asked to be at the church by 2:00 pm. A viewing will be held Thursday, December 17, 2015 from 6:00 pm until 8:00 pm at the Etzweiler Funeral Homes and Cremation Service, 1111 East Market Street, York. A private burial will be held at Indiantown Gap National Cemetery.